Music educators and voice teachers are asking for resources to support gay, lesbian, bisexual, transgender and gender nonbinary students in the classroom and voice studio, so these resources are for you! Singing can be a vulnerable experience for youth, and especially for queer youth. You as a teacher or conductor can play a huge role in supporting singers and creating an inclusive, safe space in your chorus. These documents provide information and resources about transgender terminology and offer tools for conversation about gender within your chorus community. One of the most important thing to understand about LGBT people is that the words lesbian, gay and bisexual refer to who a person is attracted to. This has nothing to do with a person’s GENDER! Like all other people, transgender people can be gay, straight, lesbian, bisexual, or anything in between. Sexual orientation is different from gender identity or expression and cannot be assumed about anyone. The Gender Gumby and the Genderbread Person are tools to illustrate these differences. Confused about all the fluid and changing terms? A comprehensive resource for training transgender and nonbinary singers. Designed for educators in both the academic and independent teaching realms. Want to make your rehearsal and concert restrooms inclusive and safe for all individuals? Click here for inclusive restroom signage from My Door Sign. GALA conductor Paul Caldwell, presented a ground-breaking workshop at the national 2015 ACDA conference. His research, along with Joshua Palkki, was conducted from over 1,000 students. Be sure to review the recommendations at the end for how teachers can create safe classrooms. GLSEN (pronounced "glisten") was founded in 1990 by a small, dedicated group of teachers who came together to improve an education system that too frequently allows its LGBTQ students to be bullied, discriminated against, or fall through the cracks. Over 25 years later, that small group has grown into the leading national education organization focused on ensuring safe and affirming schools for LGBTQ students. For the 9 out of 10 LGBTQ students who experience some form of mistreatment in school, education can be a frightening experience. It’s incumbent upon parents, families, friends, and allies to make schools safer for ALL students. PFLAG chapters work directly with schools and stakeholders in their communities, providing support, resources, training, creative programs, and even model policy to create an environment of respect. The Minnesota Department of Education developed this toolkit to help Minnesota schools create environments where transgender and gender nonconforming students are safe, supported and fully included, and have equal access to the educational opportunities provided to all students as required by federal or state law. Download Toolkit here. Gender Spectrum offers resources to empower your relationship, work, and interactions with youth and children. From how-to guides, to respected research, to sample training materials, we provide you with the tools necessary to create gender inclusive environments in your homes, offices, and communities. For additional resources, see the Repertoire resource page. Database of choral repertoire that challenges gender stereotypes. Conductor Josh Palkki asks whether male choirs today accurately reflect the contemporary needs and attitudes of male singers. Many GALA choruses include individuals who identify as transgender or gender non-binary. Choruses also have singers of varied genders that sing within a single vocal section. For example, a chorus tenor section might have singers who identify as male, women who happen to sing in the tenor range, transgender individuals or singers who identify themselves as non-binary. For this reason, conductors and choruses should refer to voice sections in all rehearsal settings as soprano, alto, tenor bass rather than "women" or "men" as a way of honoring the diversity of genders that may be present whether visible or not. GALA Choruses has adopted a gender-neutral language statement for all events, rehearsals and concerts in order to model language that is inclusive of multiple genders. We encourage all choruses and conductors to not make assumptions about individual gender based on voice section or by appearance. GALA member choruses are encouraged to adopt their own statement to include in singer handbooks and in contracts with guest clinicians and guest artists. The statement below may be adapted for your own chorus. GALA Choruses strives for gender inclusivity in recognition of the many genders represented within our member choruses, singing sections and the LGBT community. When working and communicating with singers and choruses within the GALA community please keep the following guidelines in mind. Please refer to sections by voice part rather than gender, ie; tenors and basses rather than men or women. There are also gender inclusive ways that you can address a chorus as a whole. People or folks or simply everyone are more gender-neutral options (as opposed to Ladies and Gentlemen). We know that gender specific language is a part of our culture and we don't expect each individual to overcome years of conditioning overnight. We would, however, appreciate your attempt to address our members in the most gender-neutral way possible. Thank you for being a guest of GALA Choruses. Explore transgender voices in depth under the Singer section of the GALA Resource Center. 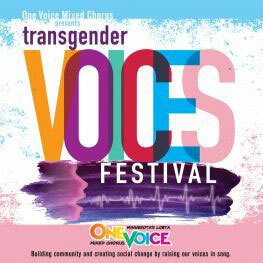 Or, peruse presenter materials from the Transgender Voices Festival. More videos on the Trans Singer page. Trans singer Kris Zurn explores his voice with teacher, Sue Zemlin. Voice clinician Lisa Butcher shares her journey coaching transgender singers. 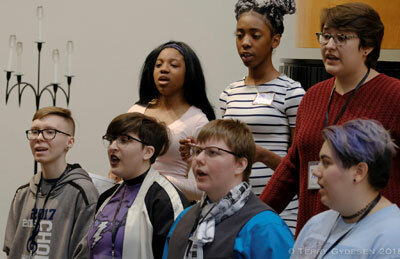 The April 2018 Transgender Voices Festival featured two full days of workshops for transgender and non-binary singers, as well as for music and voice teachers. Peruse the entire list of handouts, PowerPoint slides, and presentation materials here. Erin Donahue’s workshop for transgender vocal performers includes lots of great detail on the physiology behind trans voice.